Slavery is a word that usually reminds us of the nineteenth-century world when the mistreatment of workers was normal, when there were no labour rights and some categories of workers were not seen as human beings, but merely as objects who belonged to their owners. Nowadays it is assumed that slavery has been eradicated from our modern society, but this is not true; India, North Korea and China own the records for the percentage of slaves among total population. A recent study of the Walk Free Foundation shows that in European countries such as Poland, Turkey and Italy the mistreatment of foreign and local workers has become more common. It is called “modern slavery” and Italy is now starting to openly discuss this issue. Recently, in the Apulia region, South of Italy, a 50 year-old woman called Paola Clemente died from excessive strain while she was working as a farmhand in a vineyard. After her death an investigation was opened and it provides a terrible truth; she worked in the field almost twelve hours per day from 3 am to 3 pm under the Southern Italian sun. Every day she had to travel 155 kilometres (almost 96 miles) from her hometown to work. She also had a cardiac disease which made her work much more difficult. How much was she paid for each day of work? Almost 30 euros. Beware that Paola Clemente’s case is not an isolated one; lots of Italian women and men who have been pushed into poverty by economic crisis are now forced into this type of work in the fields. They have no other choice. The inquest of Clemente’s death led to the arrest of six people, charged with exploitation of her and other colleagues. 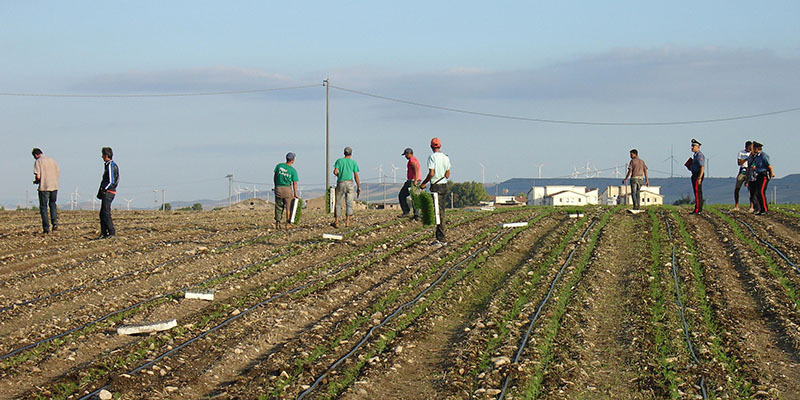 It was not the first time that an inquest of this type has happened in Italy; in 2010 thirty people were arrested for the exploitation of immigrants working in tomato fields in Rosarno, Calabria region. This inquest revealed that they were forced to work 15 hours per day without contract or a proper salary (the average wage was about 15 euros per day), working under the hard sun and living in slums built near the fields where they had no water, light or health assistance. In the Italian agriculture sector, workers are often exploited. For their work, an Italian farmhand can receive 20-30 euros per day, but this amount falls to 15 or even 5 euros for immigrant workers. If these day labourers do not accept their labour conditions, poor pay and lack of regular contract, they can be fired. Workers are watched by bosses who give them orders and force them to work. In Italy this phenomenon is called “caporalato”, the “recruitment of day labour”, whose translation derives from the military word corporal. Law against caporalato: a possible solution? It can be said that caporalato has always existed in Italy, but it began to disappear with the improvement of working conditions and the economic boom after WWII. The labour chart of the 1970s was a miracle for Italian workers, who saw a vast improvement in their working conditions. But these laws have not made caporalato disappear; it has simply started to become less common and transferred to working environments that are linked to organised crimes. In Italy, all labour sectors have been involved in the fall of average salaries and vulnerable to exploitation of workers, but the agriculture sector has seen the worst impact of the economic crisis. Average wages have fallen and most people have been fired from their work and forced to join day labour in the fields. Average wages fell in the agricultural sector too; workers have been paid less and less while working more. With the recent refugee crisis many immigrants have been recruited for illegal work in the fields and there have been reports that they are not paid at all for their work. Since the death of Ms Clemente and the Rosarno inquest, many people have found the courage to talk about the caporalato issue. It is not the first time that Italian cities have become famous for caporalato. After the Rosarno process a specific law was created; the n.148 of 2011, which introduced exploitation at work in the Italian penal code. But even after this law was created and several people arrested, caporalato still exists and it cannot be eradicated only with law, but also with a cultural and economic process. The majority of bosses involved in caporalato are linked to organised crimes, but this phenomenon should not be viewed in such a simplistic way. After the economic crisis, employers and day labourers in all sectors have became more exploitative than ever, even from “legal” companies and bosses. Their labour guarantees have simply fallen down with economic crisis. Italian labour law was once one of the most inclusive and protective, but with the economic depression the Italian government has reduced the protection of workers. People who have been fired have to accept poor working conditions in order to secure a job in the stagnant market. Being exploited has started to be perceived as the only way to be employed. The only way to stop caporalato is to create more jobs, offer guarantees to workers, and pay more attention to exploitation in the workplace. There is an assumption that mistreatment and irregular contracts are acceptable in a period of economic crisis. Italy must guarantee dignity to its working population again.